In general I tried to avoid Black Friday as much as possible (which is pretty much impossible!) as I didn't want to be tempted into buying things that I can't actually afford at the moment. But when I received an email from Escentual offering early access to a small but amazing Black Friday offer I did actually squeal (which I then tweeted to Escentual so they knew how amazing they were!). I think there was only around 21 products in the promotion, but they were all amazing products and were available at half price. 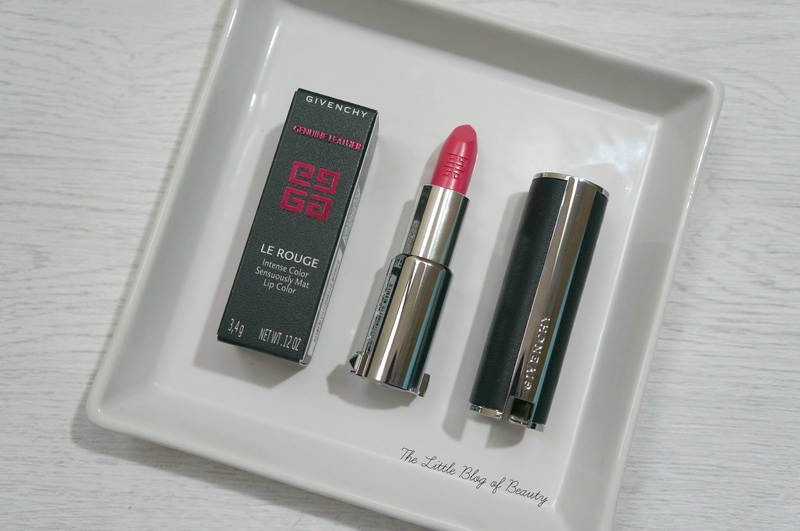 I snapped up a Jean Paul Gautier set as a Christmas present for my brother (which I will probably be touching on in another post) and then spotted a Givenchy Le Rouge lipstick, which I've actually had my eyes on for a few months now, so I snapped that up too. The downside of the offer was that this was only available in one shade; Rose extravagant. If it had been a colour that really didn't appeal to me then I wouldn't have bought it, as there's no point buying a shade you're not going to use no matter how cheap it is. But as this is a shade I would have considered purchasing anyway I went for it. The Le Rouge lipsticks have a RRP of £25, so £12.50 is a complete bargain. Being Givenchy this lipstick just screams luxury. 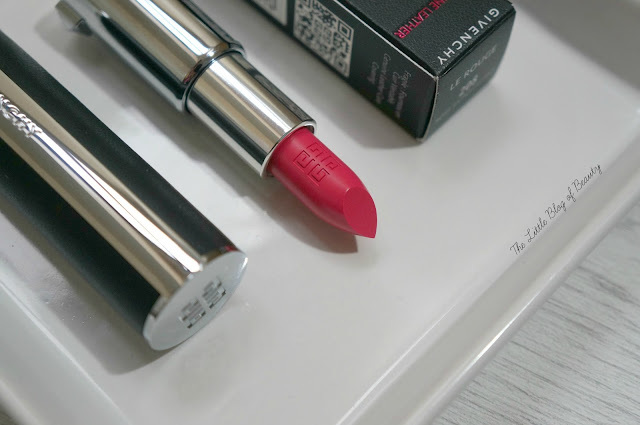 The lipstick comes in a very sturdy black cardboard box that has a leather effect to it and white writing and the only colour on the box is a gorgeous glossy cherry red Givenchy logo and the words 'Genuine leather'. Yes, the lipstick casing features genuine leather. Not great if you're vegan (but then it also contains beeswax), but for non-vegans a real touch of luxury. The lid of the lipstick is covered in black leather with a silver look (not real silver!) end featuring the Givenchy logo and a silver strip running down the side of the case with the word Givenchy engraved on it. At the bottom of the case there's two little silver pyramid shapes you use to grip the case so the lid can be removed. The lid is held really secure so I do sometimes have a little trouble getting the lid off. Once the lid is removed you find a silver bullet casing featuring Givenchy engraved under where it is engraved on the lid. You then wind up to reveal the lipstick bullet which is also engraved with the Givenchy logo. This is most definitely the kind of lipstick you won't mind pulling out in public, and waving around a bit of people see it! As the name suggests it is a matte lipstick (although I'm not sure why this is spelt mat?) but it is such a pleasure to apply and wear. It glides onto your lips with ease, there's no tugging or dry feeling formula with this baby, and you probably only need one swipe too. It is a lipstick rather than liquid lipstick, so it doesn't dry down to a full matte finish, but it is pretty matte for a lipstick. Even though it is matte I didn't think it would stick around for that long but I've been really pleasantly surprised. Last week I popped this on before a long car journey, a Chinese meal featuring several courses and a nap and afterwards although it maybe could have done with a little touch up it was still in place. I'd say this could be a five hour one, amazing stuff! The shade is possibly a little summery for this time of year but I do like the option of a bright shade all year round and I've been enjoying wearing this over the last week or so. I'm sorry I don't have a swatch photo to show you because my camera has gone to heaven (Santa is bringing me a new one), my phone won't focus properly on a swatch and I couldn't find my dads camera. When I checked for swatches on Pinterest before purchasing this I thought it might be similar to MAC Impassioned and I wasn't far off. This is a little lighter and maybe slightly more towards the coral side of things but they are quite close shade wise. I'm so glad I snapped this up for just £12.50 as it's a gorgeous lipstick and if I was a little bit richer right now I'd definitely pay the full price of £25 for it. Rose extravagant is currently out of stock but there are plenty of other shades to choose from on the Escentual website. Have you tried a Givenchy lipstick? What a great bargain, the shade looks beautiful! I do love hunting out a good bargain!